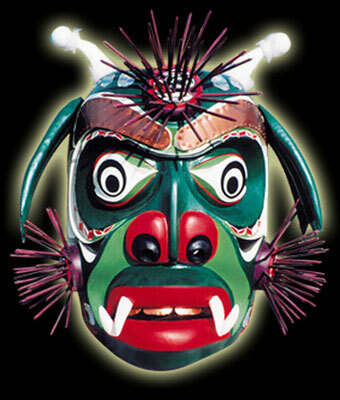 Yaggis is one of many Kwakwaka'wakw sea monsters capable of causing storms, waves and dangerous whirlpools and is danced as part of the Winter Ceremony. The eyes glance upwards; the exaggerated flared nostrils almost overwhelm the bridge of the nose. Copper teeth appear in the slightly opened mouth, which can open and shut and the lines surrounding the mouth resemble other depictions of fish gills in the Kwakiutl art.